Yesterday’s Veggie Gardening Tips article examined strategies for planning and planting a fall vegetable garden. Today we’ll take a closer look at a few ideas for raising, harvesting, and selecting cold hardy plants for growing fall vegetables in the home garden. Fall vegetables don’t require any special care; in fact you’ll spend less time caring for your fall crops because of the favorable autumn growing conditions. The plants will grow rapidly at first and gradually slow as the days become shorter and colder. You’ll be happy to discover that destructive insects won’t be as numerous, nor create as much of a problem as they can during the summer. The most common fall insect pest visiting the garden may be aphids, which fortunately won’t cause much of a problem to the growth or production of healthy plants. The fall gardener will struggle less with weed control because the weeds will germinate less frequently and grow slower than they do during the warmer growing seasons. Compared to the hot and dry summers, fall usually brings an increase in the amount of precipitation, eliminating another time consuming garden chore of irrigating the garden. With just a little attention and effort you may be surprised to find that growing fall vegetables in the backyard garden is even more enjoyable than planting a vegetable garden during the spring and summer seasons. Following is a list of fast growing, cold hardy crops that are ideal for fall vegetable gardening. 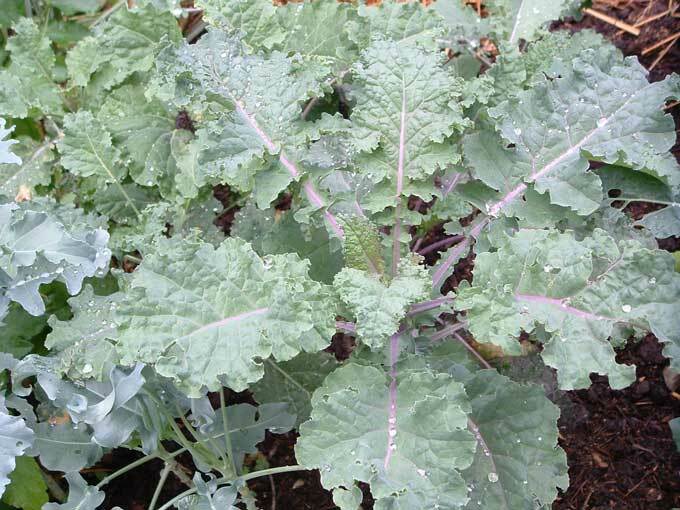 Kale – Nutritious leafy greens on productive plants that over-winter easily even in cold climates. Collards – Another leafy green similar to kale but with larger, stronger flavored leaves. Lettuce – Plant varieties bred especially for growing during the fall season or in cold frames. Spinach – Not as easy to grow as kale and collards, these leafy greens will also over-winter. Turnips – Here’s a quick maturing root crop that’s productive and easy to grow. Rutabagas – Larger and sweeter than turnips, plant earlier in the summer for fall harvests. Broccoli – Popular, productive and much easier to grow than cauliflower. Cauliflower – Finicky grower, planting must be timed well in order to develop large heads. Mustard – Spicy hot leaves, this is a very fast growing vegetable. Mache – Very cold hardy, mild greens can be grown right into the winter months. Cabbage – Grow from transplants (like broccoli and cauliflower) or start seeds indoors under lights. Oriental Vegetables – Wide range of unusual varieties are available for fall production. Escarole – A bitter leafy green vegetable that can be cooked or used raw as a salad green. Endive – Similar to escarole with attractive frilly leaves. Brussels sprouts – Start seed in early summer or purchase transplants. Arugula – Fast growing leafy greens for salads or gourmet recipes. Leeks – One of the hardiest plants in the garden, leeks can even withstand winter freezes. Cooler autumn temperatures make it a delight to spend time outside in the garden and also provide an advantage when it’s time to harvest your fall crops. Maturing crops including cabbages and root crops will maintain their quality and stand much longer in the garden during the fall season. Leafy greens can be harvested a leaf or two at a time from each plant during the season, leaving the smaller leaves in the center portion of the plant to continue growing and producing new leaves. Or you can harvest all of the leaves at once from the mature plants late in the season. Harvesting cold hardy vegetables after they have been hit with a touch of frost can enhance the flavor and increase the sweetness of greens such as kale and collards. After gathering the greens, allow the plants to over-winter in the ground and you’ll be rewarded with future harvests of early spring greens just as soon as the winter has ended and spring arrives. Don’t panic upon the arrival of frost or light freezes, as a period of Indian Summer often follows with milder weather conditions that encourage fall crops to continue growing and producing fresh produce for the kitchen. However, your fall vegetables should be harvested before severe freezes take hold in the garden to avoid damage to the crops and to make the process of harvesting easier for the gardener. For more ideas and tips to help when growing fall vegetables in the home garden take a look at the previous entries on Fall Gardening and Growing Vegetables in Cold Frames. Excellent posts, as always. I grew broccoli last year and it was fantastic. I grew cauliflower as well and while it grew well and looked good, when I went to harvest the first head there were tons of snails up in it. Ugh. I just cannot deal with snails. But I’ve got cats and a dog and am hesitant to use the really strong bait. Any ideas? This is the third time I’m planting my spinach, swiss chard, and lettuce seeds. I saved the best seeds for now (fall). Why are the plants taking so long to root and grow? I live in norhteast PA area/soil good/loose/sunlight & shade available. Hi Marg, lettuce, spinach, and Swiss Chard can all be extremely temperamental when it comes to the seeds germinating and starting leaf growth. I’ve watched arugula, kale, collard, and turnip seeds germinate and spring up almost overnight, whereas lettuce and spinach sometimes take weeks just to break the soil’s surface. Spinach and lettuce will also simply refuse to germinate during hot weather even when planted in the fall garden. Some gardeners roll lettuce seeds up in a moist paper towel and place in the refrigerator for a couple of days before planting them in the growing beds. You can also try starting the seeds indoors under grow lights to see if that gives you better results when growing fall vegetables. It helps to use fresh seed and planting your lettuce and spinach seeds rather thickly will improve the likelihood for success. Once you have sown the seeds make sure the fall garden beds are watered occasionally if the weather is dry to provide moisture for the seeds and to prevent the soil from forming a hard crust that is more difficult for the seedlings to penetrate. It sounds like you are doing everything right, so the only thing left is to just be patient and wait for these unpredictable seedlings to make their appearance. We started our carrots, kohlrabi, cabbages and lettuce in August. For the second year in a row I’ve had trouble growing sweet peppers where I never had a problem before. The plants are beautiful, lush, green and over 5 feet tall, but there is not a bloom nor fruit to be seen. Any ideas? Great info. Glad I stumbled upon your blog. This could really help me plant my veggies. Thank you also for enumerating the best vegetables we can plant during fall. Great info! It’s July now and I’m exciting to plant my first fall vegetable patch. Thanks again for the information. @sherri with the leafy peppers : too much fertilizer will cause plants to grow foliage like crazy instead of flowering and bearing fruit. Thanks for the info! SNAILS ARE A PROBLEM. There are solutions.